As the summer canoeing season kicks into top gear, Martin Dreyer’s Change a Life Academy is ramping up its 2018 FNB Dusi Canoe Marathon preparation at the upcoming Ozzie Gladwin Canoe Marathon on Sunday, 26 November. A handful of the Change a Life stars had a busy winter period with Under 23’s Mthobisi Cele, Mpilo Zondi and Under 18 paddler Mvelo Ngidi taking on the gruelling Berg River Canoe Marathon and all finishing in the top 10 after four days of brutal paddling. The Fish River Canoe Marathon was the next assignment for the CAL Zulu’s and at the national K2 river championships it was Mpilo Zondi and Mthobisi Cele who combined to finish third in the competitive Under 23 category. With the warm summer conditions comes the thought of the three-day journey from Pietermaritzburg to Durban in February and Academy founder Martin Dreyer sees the Ozzie Gladwin as a vital part of their preparation for the Dusi. “The Ozzie Gladwin includes a long stretch of river paddling which is so important for the guys as river paddling is non-existent whilst KZN remains gripped by drought,” Dreyer said. “It is not a very technical stretch of river but it plays an important role in seeing where the fitness levels are going into the rest of the season. Despite being the first seeding race of the new season, the Ozzie Gladwin is also a race that incorporates all three aspects of Dusi paddling, flat-water and river paddling, as well as portaging. “The eight kilometres of flat water at the start is a big test and it will show how the guys cope with bunch racing. “Riding wave or drafting is important with flat water paddling because a solo paddler is slower than a group taking turns pulling the bunch. It will be interesting watching this flatwater showdown before everyone scrambles onto the 2km portage down to the river. “The Ozzie Gladwin is a great season opener and a good way to see how strong combinations are,” Dreyer added. There is a slight feeling of a changing of the guard amongst the Change a Life Academy with the younger generation starting to put in some good performances. 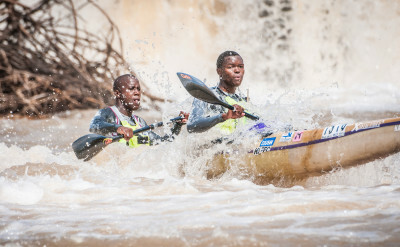 Non-Stop Dusi winners Mpilo Zondi and Mthobisi Cele will be the pair to look out for, with the young Mvelo Ngidi pairing up with Thabani Msiya as well as Mmeli Cele and Msawenkosi Mtolo. Change a Life stalwart Kwanda Mhlophe will be teaming up with Sipho Canham for the Dusi season.